Five years ago today, Google and T-Mobile took the stage at a press event in NYC to unveil the T-Mobile G1 (made by HTC) as the first device to run Android. As you all know now, Android is the number 1 mobile operating system in the game across the globe, and it’s not really even close at this point. But to think in 2008 that the original G1 would be the starting point to what we have now, is almost unimaginable. Certainly, there were those who had the vision to see its eventual power, but boy have we come a long way. In a post to his G+ account, T-Mobile Sr. product manager Des Smith talks about the G1 launch, the weeks leading up to its unveiling, testing prototypes the night before, and eventually participating in the press event that included the recently-departed Andy Rubin on stage, along with a surprise appearance by Sergey Brin and Larry Page on rollerblades. Oh, and 3G, people! 3G! 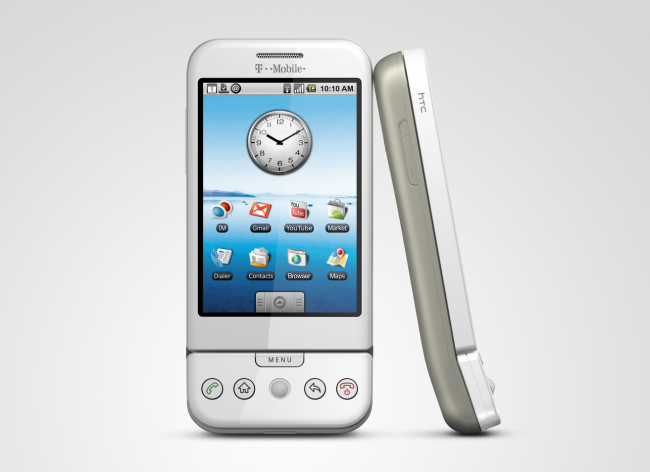 We weren’t around for the G1 unveiling, as we got our start during the original DROID launch a year later in 2009. That said, I’ve spent the last hour or so watching old G1 reviews to gain some perspective and also to laugh a little. Any G1 memories or thoughts to share?